Palms Professional Forestry Cranes for forestry trailers and tractors. This page is being updated and more info will appear soon. 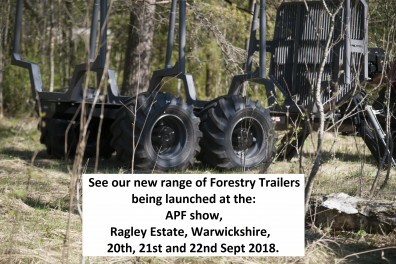 The new range of Riko Palms professional forestry trailers are built by one of Europe’s top manufacturers. They come with a market leading 3-year warranty. There are single beam and double beam chassis with maximum gross capacities of 8500Kg, 10,500Kg, 12,000Kg, 13,000Kg, 16,000Kg and 18,000Kg. They come complete with rocking beam axles, timber bolsters and headboard. Just a few of the numerous options include different tyres, air or hydraulic brakes, bed extensions, lights, steering drawbars, brash bodies etc. There are also models with 4-wheel drive.